Okay, I know it's a bit early but Easter Eggs are on sale already! I picked up 3 small sized Cadburys Easter Eggs in Centra Shandon Street Cork for 5 euro. The non deal price is €3 each. The Cream egg one came with one cream egg for instance. The deal wasnt advertised in store but the kind lady at the til scanned the egg at the til 3 times to see if there was a deal and bobs your uncle. Yes. 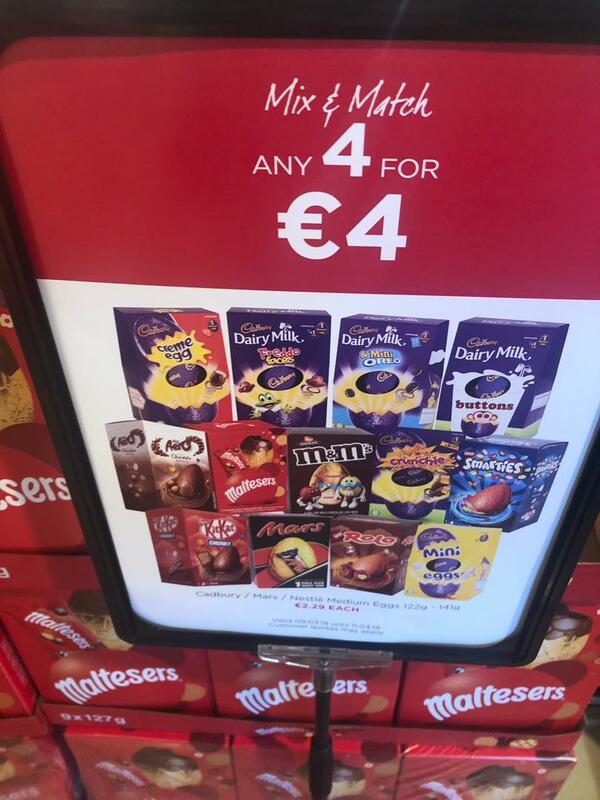 Super-Valu have all medium Cadburys/Nestle/Mars eggs 3 for €5 until Eater Saturday. Often gets reduced to €4.50. They generally go 5 for €5 in Tesco for a few days. Last edited by JP Liz V1; 08-03-2019 at 23:43. Dunnes Stores selling 4 Easter Eggs for €4. With €5 off over €25 too - get 25 eggs for €20. Can't imagine these will get any cheaper. Offer ends 11th March. Two Dunnes I was in had it limited to 20 per transaction. Got 64 yesterday morning before they enforced the quota. A "medium" last year tended to be 1 single full size bar and a 100g egg. This is like getting 1 bar and 2 dairy milk bars. A retail dairy milk bar is showing as 53g on tesco. The freddo egg is only 122g in total. So looks like a 100g egg and a mere 22g of "freddo faces"
A creme egg is 138g, 100g and the creme egg is standard 38g. Mars is 141g so likely a 100g and not full retail bar, but multipack size. Or a variety of eggs for your own kids, as these offers tend to be cheaper per kilo than bigger eggs. And kids might prefer a load of different eggs. because today's kids need a greater volume of chocolate/sugar. much bigger portions please!